An iconic monument, the famous Santa Catalina Arch is a place you would not want to miss. It's on a very nice pedestrian street with a beautiful view of the volcano in the background. You will easily stumble across this when walking around Antigua. Probably the most photographed site in the city. Special about the Arch is the fact that in the back you can see the volcano. Besides that, it's a beautiful building. 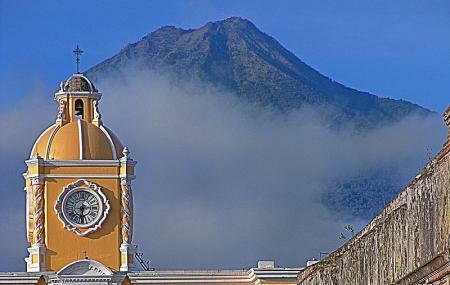 Explore Santa Catalina Arch and other prime spots of the city using Antigua Guatemala trip planner. Your worry of where to stay in Antigua Guatemala is sufficed by bunch of interesting and comfortable lodging options in the Antigua Guatemala like La Villa Serena Bed & Breakfast, Hotel Lo De Bernal and Casa Mia Hotel. Draft the best Antigua Guatemala vacation packages using ideal templates offered by TripHobo. Also explore how to reach Antigua Guatemala on the go! Love this? Explore the entire list of places to visit in Antigua Guatemala before you plan your trip. Fancy a good night's sleep after a tiring day? Check out where to stay in Antigua Guatemala and book an accommodation of your choice. How popular is Santa Catalina Arch? People normally club together Complejo Deportivo Guatel Zona 10 Villa Nueva and Colonia Puerto Rico while planning their visit to Santa Catalina Arch. A great photo stop if you're ever in Antigua. If you're there under the right conditions, you can get a great shot of the volcano right under the arch. Not to mention all the great places to eat and shop along the way. It's easily walking distance (just a few blocks) from the city's center. Don't forget to look up on your walk at all of the amazing architecture that makes it one of my favorite cities in the world! I know this is the most photographed landmark in old Antigua. But I am just as impressed as my last visit. It seems to be part of a convent turned hotel. Nevertheless, it's best seen and experienced in person. This beautiful Arch hides a bit of a dark past. It was built to prevent cloistered nuns, often placed by their families, to move from one portion of their convent to another without ever being seen or seeing any of their family, former friends or the public. It is a beautiful archway! A lovely attraction that is on the front of all the guidebooks for Antigua. Get there early in the morning for a quieter experience. At peak times, it can get quite busy along this road and it will be impossible to get the perfect photo you are hoping for! If you just want to have a look, then you won't be disappointed. There are several tourist places on this street, including the Chocolate Museum, which explains why it can get busy with visitors and people selling their wares.